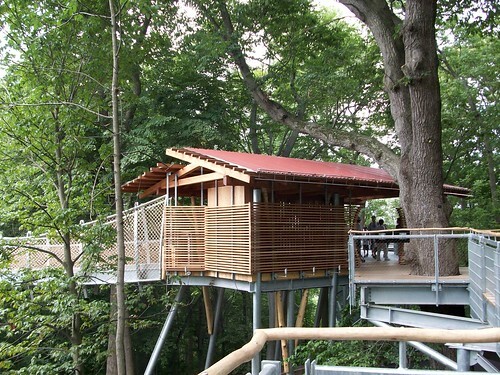 Out on a Limb gives you a heightened awareness of trees – from scaffolding that’s 50 feet above the forest floor. One of the Arboretum’s oldest living oaks grows within the exhibit. It’s lineage dates back over 250 years. If you live anywhere near Philadelphia, PA, you really must take a day trip to The Morris Arboretum – a 92-acre horticulture display garden that features a spectacular collection of rare and mature trees in a Victorian landscape. Beyond the Arboretum’s picturesque spots such as a formal rose garden, Japanese gardens, swan pond, meadows and the elegant Fernery, it also features a new exhibit called Tree Adventure. This dramatic installation explores the relationship between plants and people with its central theme, we need trees, and trees need us. Industrial design meets nature. A path of discovery takes you to a human-sized bird nest complete with eggs. 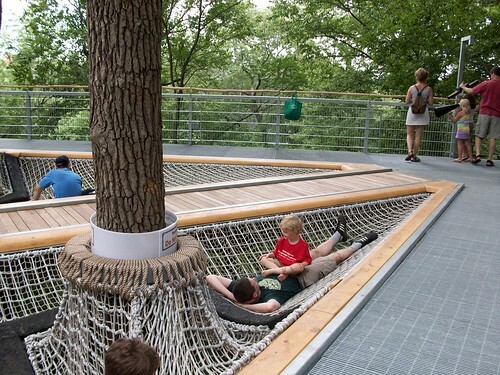 The iconic centerpiece of the Morris Arboretum’s Tree Adventure exhibit is Out on a Limb, a striking 450-foot long walkway that soars 50 feet above the ground, and give visitors a bird’s eye view of the forest. 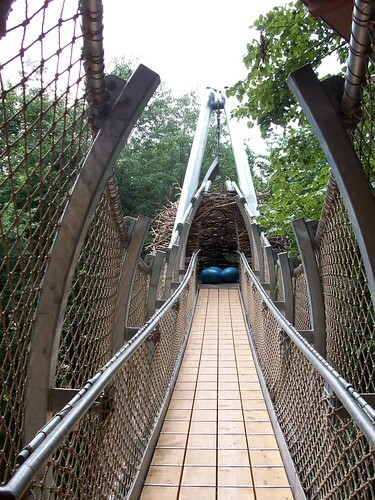 From Out on a Limb, visitors can cross a swaying Suspension Bridge to the Bird’s Nest, scamper onto the Squirrel Scramble’s rope-netting skirting two towering trees, head to the top of the Wissahickon Vista platform for sweeping views or just wander along the Canopy Walk rising high above the forest floor. Ingenious netting gives you a “bird’s eye view”. Be sure to visit the Arboretum’s other exhibits like The Summer Palace. Beyond this exhibit – be sure and visit The Summer Palace – a 25-foot seasonal sculpture made of sticks and saplings by renowned artist Patrick Dougherty. And if you have children, there’s a model railway with electric trains running through the gardens. It’s especially festive around the holidays. When my son was a toddler – he wouldn’t leave that area no matter how cold it got. Watching the model trains weave in and around the plants is mesmerizing. Members are permitted to have private tours with the Arboretum’s staff or volunteers. We took a public tour the day we were there and learned much about the native plants that do well for backyards in our area. It’s really a jewel for gardening tips, beautiful vistas and inspiring design. Click here to read all of Lori’s posts. Lori – thanks for sharing these photos. What a great place – wish I lived near Philly! Love this post! 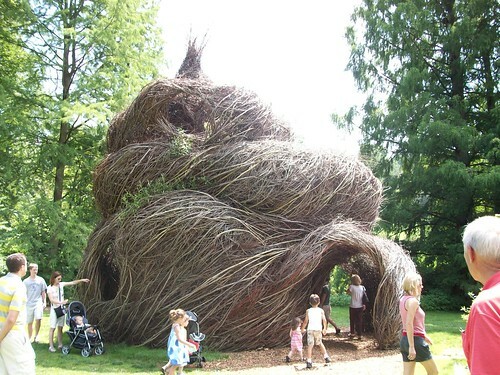 I saw one of Patrick Dougherty's incredible works at the Nasher Museum in Durham, North Carolina and loved it! Then, some months later, just stumbled upon another one on the Colorado College campus in Colorado Springs. I was so excited that I knew what it was and who created it!! What a great post – I need to visit Philadelphia to see this arboretum and the shop "terrain"! !